I am currently trying to hang on to every last minute of STAYCATION 2012. I got in a great morning sweat session. 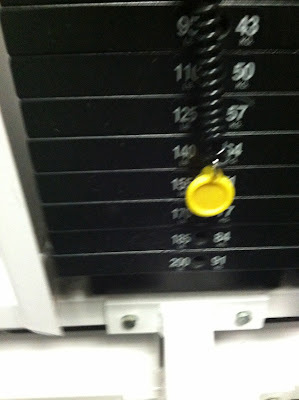 Set a new PR on the hip abduction(155)+Jump & Drill + Bollywood Sweat. Best part of my workout? I was complimented on my push up improvement, even though I haven't practiced at all this summer. TRX and lifting has improved my chest strength and I think that is what has helped my push ups. After the gym I took my sweaty smelly self to get my blood work done. I was already fasting so I figured get it out of the way and be done with my physical for the year. Little did I know I would be sitting in the sweaty clothes, in a room with no AC for over an hour. I feel bad for the people who were sitting with you. By the time I was finished it was almost noon, so I was famished. Bagel thin with 1 egg, 1/2 cup egg whites, shredded mozzarella, 1 slice of bacon. I was fueled up for my trip to Target. I am currently on the hunt for small envelopes, similar to the size you would send/receive for wedding response cards. I knew Target wouldn't have them, but I needed an excuse to go and buy things I wasn't planning on buying. These are just three of the things that ended up in my cart. I also got myself some new pink workout socks ( totally needed them) and a journal from the dollar spot for FitBloggin '12! I have already started reading Gone Girl and I LOVE it! I spent most of my afternoon/night reading it and plan on picking it up as soon as I finish this post. More importantly, that combination of vanilla chocolate chunk Chobani and Special K chocolate delight is the best snack ever. Eddie and I are off to get haircuts and then we are going out for the Jets VS Giants game later. Oh I def want to read gone girl!! I've heard a ton about it!!! It looks really good! Congrats on your new pr! That's so great!! Also, the chocolate chunk chobani is my fave! 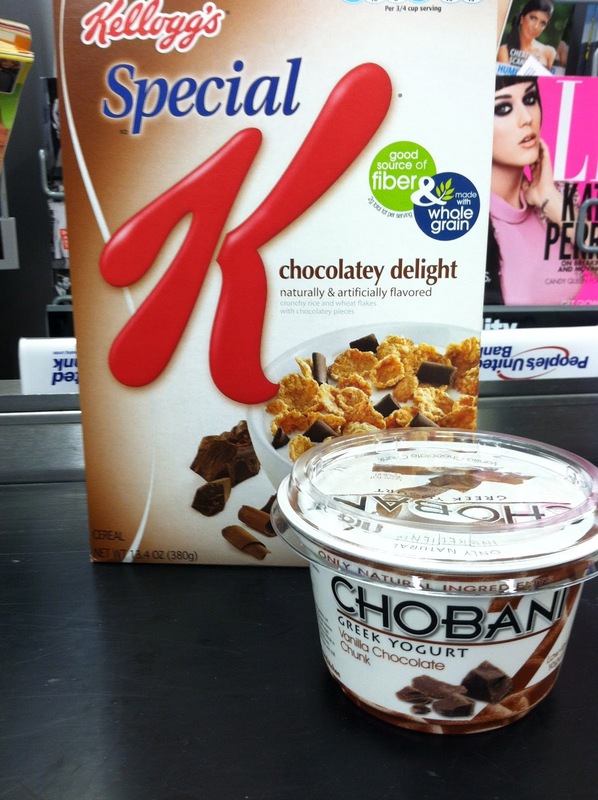 I'm totes trying it in the chocolate special k now!!!! Thanks for sharing! Spalove! I would love to read Gone Girl!! I heard that there are 2,000+ people on wait list to get it from the NYC library -- crazy!! Great workout! I've never read Gone Girl but I've heard it's good. I'm currently reading Gone Girl...I'm only a few chapters in but I like it so far! Your the second blogger I've seen post about Gone Girl! Will have to check it out. Look forward to meet a fellow new yorker at FitBloggin. I loved Gone Girl!! I read through it so fast, and it's a big book! Oh I would've died if I had to sit in a room with no ac! Glad you made it out alive though girl :) Hope you and the boy had fun @ the game! !